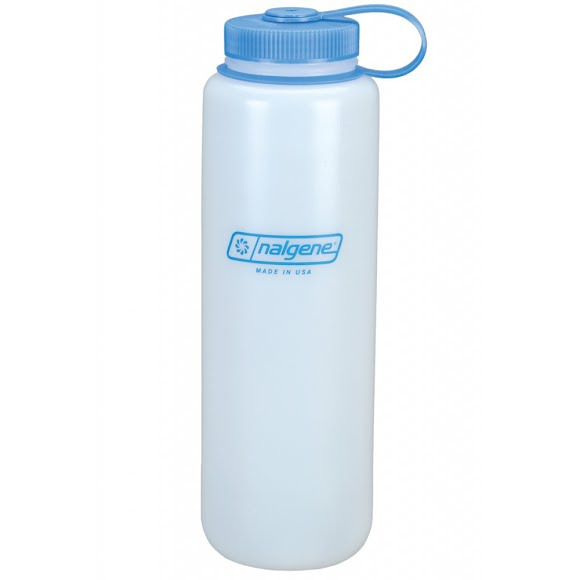 Nalgene's best seller is back and better than ever with this Triton Wide Mouth 48 oz silo water bottle. It's designed with large opening that easily accommodates ice cubes, and fits most water purifiers and filters and makes hand washing a breeze. The attached loop-top never gets lost and screws on and off easily. Printed graduations let you keep track of your hydration. Nalgene &apos;s best seller is back and better than ever with this Triton Wide Mouth 48 oz silo water bottle. It&apos;s designed with large opening that easily accommodates ice cubes, and fits most water purifiers and filters and makes hand washing a breeze. The attached loop-top never gets lost and screws on and off easily. Printed graduations let you keep track of your hydration. Tritan retains the versatility of copolyesters. But it also can offer unexpected advantages, including easier processing, higher temperature resistance and significantly greater impact strength. Through its toughness, chemical resistance, dishwasher durability and density characteristics, Tritan can offer sustainability advantages over glass and other clear polymers. These may include: longer product life, less breakage, lower energy requirements for shipping and less protective packaging required. Dishwasher safe, please make sure cap does not contact the heating element. Manufactured from Eastman Tritan copolyester that is manufactured without BPA (Bisphenol A). Recycling code #7.